- Racecar driver Alex Tagliani did not realize the season finale he was hoping for in Saturday night's Pinty's Fall Brawl, a 200-lap affair held at the one-kilometre paved oval Jukasa Motor Speedway located near Hamilton Ontario. Starting sixth, the Quebec driver suffered mechanical problems in the early part of the race and later on was assessed a pair of penalties that scuppered his quest for a championship drive. Tag crossed the finish line in 13th place, securing second place in the 2018 NASCAR Pinty's Series final driver standings. "It was a tough race to manage and the results are hard to swallow," said Alex Tagliani. "We had a good car at the beginning, but unfortunately, the steering system got off line. The car was understeering badly, slowly destroying the right front tire. It was quite difficult inside the cockpit because of all the shaking. I had to slow down around lap 60 to try and save the right front tire until our first pit stop on lap 92 where the 22 Racing crew made some adjustments to stabilize the car." In the first round of pit stops on lap 78 in the final race of the 2018 NASCAR Pinty's season, Tagliani stayed on track to lead the race and score a bonus point. From that moment on, it was a struggle to follow the leader's rhythm after receiving a pair of penalties, including one for pitting outside his pit box. "Later in the race while trying to catch the leaders, my Chevrolet Camaro EpiPen/RONA/St Hubert hit car 04 in corner 2 (on lap 175)," continued Tagliani. "He was running high on the track, came down and we touched. Race officials said I was at fault and I was assessed a stop and go penalty of one lap. During the stop, the team made several changes on the car to stop the vibration that still persisted, but it was after they changed the left tires that the car came around. My lap times were then as good as the leaders, but it was too late being one lap down with only about 20 laps to go. "It's unfortunate to end the season in such fashion, but overall we had a great year. We were competitive all season long and we fought until the end. Now, I am looking forward to 2019 where I hope to start on a better note so that I don't have to chase the point's leader all season long, but lead the championship. This is our goal for next year. "I am very proud of my crew and everyone who worked at 22 Racing. 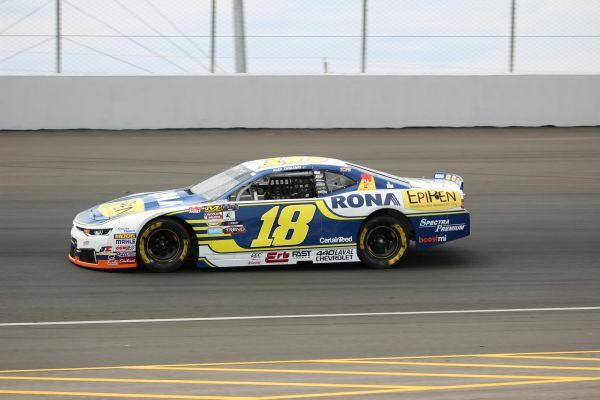 I would like to thank all the sponsors who supported me this year: EpiPen, RONA, Spectra Premium, Chevrolet 440 and Chevrolet Repentigny. With St-Hubert, we had a great time making those funny videos with the delivery personnel when I gave them driving lessons. Thanks also to Fast Wheels who has been with me for several years and to La Petite Bretonne with their Tag on the Go Oatmeal Cookies," concluded Tagliani. DJ Kennington, a former Series champion, ended a five-year winless streak by crossing the finish line first with a one-and-a-half second lead on Donald Theetge. Kevin Lacroix came home third ahead of Peter Shepherd III and Andrew Ranger. To celebrate his 20th NASCAR Pinty's win, DJ led a race high 93 laps. In the final drivers standings, Tagliani finished second, seven points behind 2018 champion LP Dumoulin. Kennington is third, 12 points back. Twenty-one drivers made the start with 19 running at the finish. Twelve cars finished on the lead lap. The race was under full course caution six times for a total of 39 laps. There were 11 lead changes among six drivers; one of the leaders was Tagliani. The Pinty's Fall Brawl, final round of the 2018 NASCAR Pinty's Series, will air on TSN 3/5 on Saturday, October 6 at 1:00 p.m. ET.